To preserve the integrity of the Zwartbles Sheep by registering with the Association animals that conform to the breed characteristics as defined in the ZSA breed standard and ensuring that members are aware of and abide by the breeding rules. To promote the use of the Zwartbles sheep in the sheep industry both as a pedigree and as a crossing ewe or sire. To encourage members to actively promote the Zwartbles breed. Zwartbles flocks regularly achieve high lambing percentages, particularly to ewes lambing later in the season. The breed is noted for its easy lambing ability, ideally suited to the novice or first-time sheep keepers or for those who have limited time. This is also a benefit on a commercial farm where saving labour is desirable. Zwartbles ewes show consistently good mothering qualities and many will produce sufficient milk to rear triplets without resorting to supplementary feeding. Originating from the Friesland area of Holland they are a hardy breed. Ewes rearing lambs for 7 years or more is not uncommon. Ideally suited for producing boxed lamb for the deep freeze or farm-gate sales. The exceptionally full flavour and leanness of the meat keep consumers coming back for more and often being prepared to pay a premium price for this quality. When crossed with any of the popular terminal sire breeds, the Zwartbles ewe produces fast-growing lambs capable of meeting the exacting standards of today's retail trade buyers. They also produce good quality wool which is excellent for spinning and weaving. The unique colour of the wool makes every end product individual and distinctive. The tanned sheepskins make desirable rugs. The Zwartbles sheep is renowned for its friendly nature making it a pleasure to keep on a day to day basis. 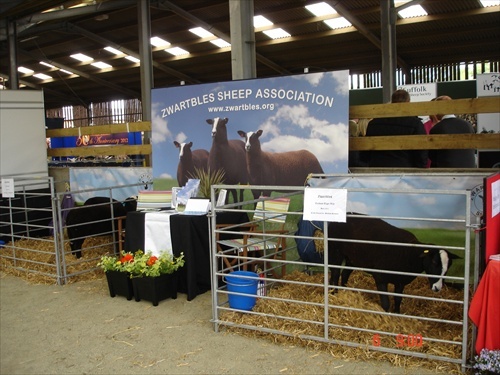 Staging breed promotion stands at major agricultural shows to promote the qualities of the breed and to advise any prospective Zwartbles flock keepers. Stands at NSA events across the country are manned by regional members specifically to promote the attributes of the breed. Promoting ZSA society sales with advertisements in the Farmers Guardian and other publications. Production of a range of merchandising products, which promote the breed. All of these products carry the unique ZSA logo, products such trailer stickers, badges and ties.